Researchers from Osaka University, in collaboration with the National Institute of Advanced Industrial Science and Technology (AIST) and Grenoble Alpes University, report an efficient technique for controlling the direction of a nano-sized magnet by heating at high speed. The researchers also discovered that nano-magnets amplify microwave signals. This group's achievements will contribute to reducing power consumption of magnetoresistive random access memory (MRAM) and artificial intelligence (AI) devices. This will make AI devices read and write to their memory more efficiently, thereby suppressing the power consumption of AI functions such as machine learning and decision making. This is another step towards achieving a super-smart society. Reducing the power consumption of information and communication devices means they could continue running for a long time, even in times of disaster. Spintronics is a widely researched field in which MRAM technology has been developed using magnetic tunnel junctions (MTJs). MRAM uses the direction of a magnetic pole to store information, so it can retain memory without standby power. Using these technologies, researchers have tried to reduce the energy consumption of AI devices. By controlling the magnetic alignment of an MTJ by using a small current and voltage, it is possible to reduce device power consumption. Hhowever, the problem for spin-transfer-torque MRAM (STT-MRAM) is that its voltage increases rapidly when its write speed is high, using a great deal of power. The research group has discovered that it is possible to write information using less energy than STT-MRAM by changing the magnetic anisotropy in an MTJ via controlling the applied voltage. To make this method practical, it is necessary to increase the magnitude of voltage-controlled magnetic anisotropy. In addition to finding proper materials, other methods for changing magnetic anisotropy have been sought. 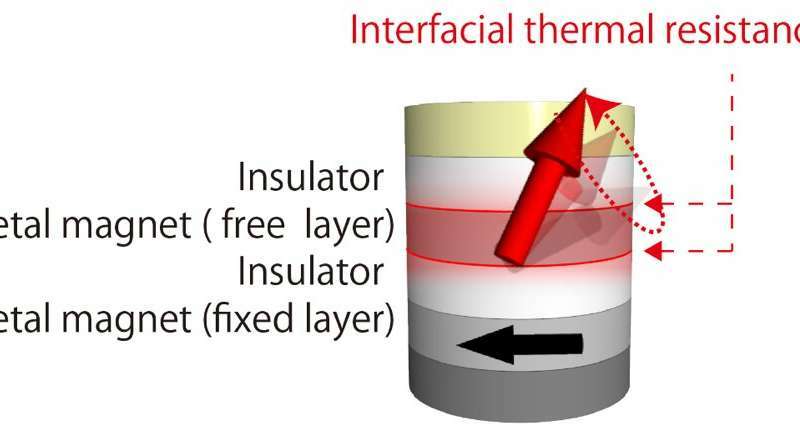 The researchers succeeded in inducing a giant magnetic anisotropy change in an MTJ with double-insulator layers by Joule heating. As temperature in the metal (free) layer of an MTJ increases, magnetic anisotropy changes, so it becomes possible to change the direction of a magnetic pole. They found that the magnetic anisotropy depended on the bias voltage due to Joule heating. This shows that the temperature increase induced by Joule heating changed magnetic anisotropy. 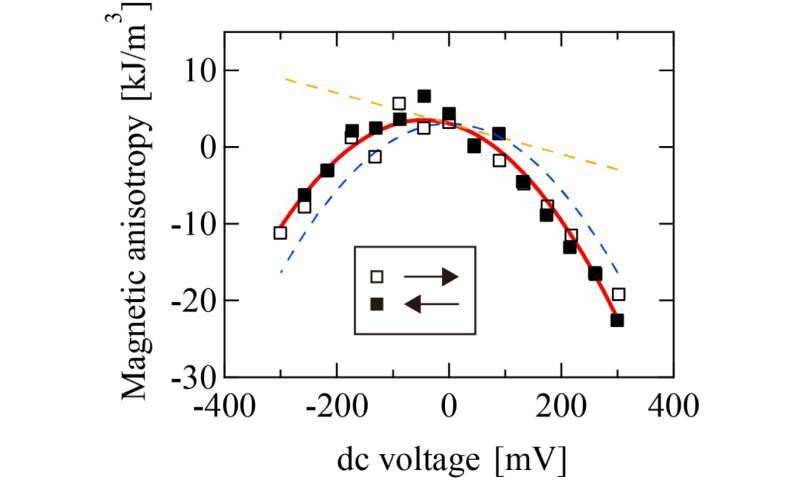 When the researchers evaluated the maximum value of the magnetic anisotropy change for a given electric field, the size of the heat effect was 300 fJ/Vm, which was almost the same as the reported maximum value of the fast voltage control of the magnetic anisotropy (VCMA) using pure electronic effect. Although the heat effect current is much larger compared with VCMA, it is more efficient than STT for high speed applications. In addition, this value will increase by improving the heat system in an MTJ. 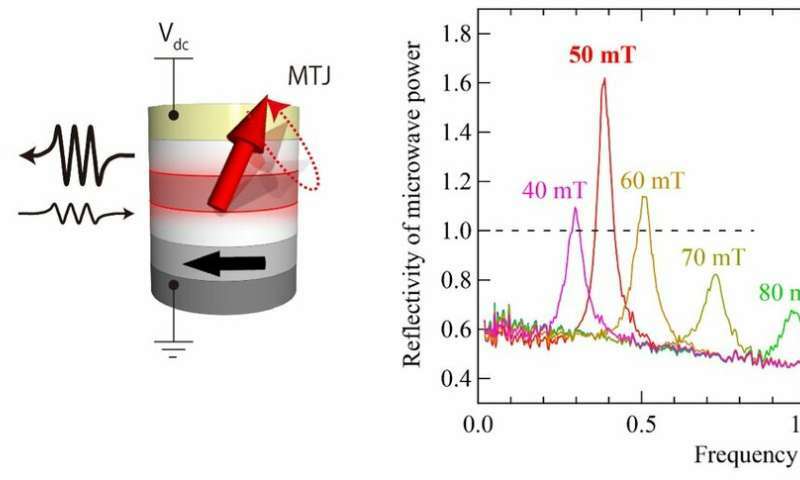 The research group also found that a microwave was amplified by an MTJ using the giant magnetic anisotropy change. Microwave amplification had been previously attempted using a microwave-frequency magnetic field; however, the microwave power obtained by conventional methods was 0.005, and there was no amplification. The group achieved a microwave power reflectivity of 1.6 with a magnetic field of 50 mT and a microwave frequency of 0.4 GHz; that is, the microwave was amplified by approximately 60 percent compared with the input microwave. First author Minori Goto says, "Our study is the first report of microwave amplification using spintronics devices. This research will open the way to developing high-performance microwave devices. Moving forward, we anticipate that our technology will be applied to new microwave devices with high sensitivity and high output. This will also contribute to low-power-consumption technology for MRAM and AI hardware."